Decorations: Ignite the memories of long ago with a Christmas tree, where the scent of pine will fill the home. Family members can set up the tree and decorate with non-breakable ornaments, such as fresh baked gingerbread men, candy canes, or popcorn garland. Remember to keep the tree out of a traffic area or place a small tree on a table, so it is not a fall hazard. Depending on where they live or if they are living alone, you may want to forego a live tree, which has to be regularly watered or lights that can cause a fire hazard, and decorate with wreaths, large bows, ornaments in a bowl, pine garland on a mantel, or wooden decorations. Don’t forget that your loved one will need help putting these items away in the New Year. Meals: Many of our fondest memories happen around the dining room table. Your loved one will enjoy the smells coming for a warm kitchen of baked good or traditional ethnic dishes that are served each year. The sense of taste and smell can be very important to stimulate memories and help get your loved one in the festive mood. We suggest that family meals be served in the morning, brunch, or lunch. Many people who suffer from Alzheimer’s become more uncomfortable and agitated in the evening due to sundowning. Also keep plenty of small snacks and healthy nibbles on hand so your loved one, who many forget to eat, has some smaller meals and food throughout the day. Beverages: One important tip for those with dementia is to keep them hydrated. Dehydration can greatly affect their mood and cause their symptoms to worsen. Perhaps a holiday mocktail in a festive color with fresh fruit garnish or hot chocolate can be served during your celebration. 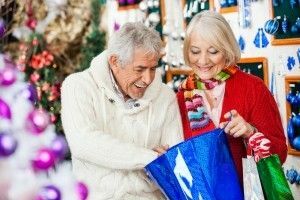 Gifts: Gift selection can be difficult and often this will depend on where they are at in their diagnosis of Alzheimer’s or dementia. But a soft blanket, warm scarf, cozy sweater or fluffy robe are greatly appreciated by the elderly who often are cold due to poor circulation and a slower metabolism. A scrapbook, framed photos, or photo album of past holidays or family gatherings is another wonderful gift to reminisce and spark memories. Scented lotions, favorite music, classic movie, or non-skid slippers in lovely wrapped paper are great surprises. Also consider function gifts like a clock with large type that displays the date and time or dementia day clock that displays the day of the week with the time of day (morning, afternoon, evening or night), a large button universal remote for the television, or a phone that displays photos of who they frequently call. Music: The holidays and music go hand-in-hand. Consider having a traditional sing-along with family or playing your loved one’s favorite holiday tunes during the celebration. Attend a religious service or holiday event featuring music. Music can be a great inspiration for your loved one to move and dance. Although the holiday season can be difficult with a loved one suffering from dementia, there are many opportunities to find the joy of the season and celebrate their life. So indulge in past memories, traditions, and nostalgia this holiday. Keep your loved one part of the festivities and adapt your celebrations creatively to make them as comfortable as possible. Happy holidays from Aegis Living!